Austin was on the UMSAE Formula Electric team and was the software lead. He was on the team from 2015 to 2018. In the graduating class of 2018, he received the gold medal for maintaining the highest GPA of all graduates. After graduation, Austin went to go work for Tesla in Palo Alto. Courtney joined the UMSAE Aero Design team in 2007, contributing to the design and manufacture of multiple competition aircraft. She was the Aero team leader in the 2010-2011 competition year, where the team won the NASA Systems Engineering Award, earned first place for their technical presentation, and finished in the top ten overall. Courtney graduated in 2011 and is working as part of the Space Systems group at Magellan Aerospace. Keith joined the UMSAE Formula team in 2007, over the course of his 4 years on the team he held numerous positions including Formula Team Leader and participated in the design of over 4 vehicles. 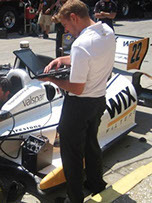 Keith graduated in 2011 and now works for Ilmor Engineering in Plymouth Michigan as a Trackside Engineer for the Chevrolet Team in the IndyCar Racing Series. Kris joined the UMSAE Aero team in 2009, over the course of his 3 years on the team he held numerous positions including Empennage Section Head, Payload Section Head, and Team Leader. Kris participated in the design of over 3 vehicles and graduated in 2012. Over the course of his 3 years, the team won several awards from Lockheed Martin, had a 2nd place international finish and back to back NASA. Thomas joined the UMSAE Formula team in 2007, along the way he held various Design Lead positions and was appointed UMSAE Executive Chair in 2010. He participated in the design of four Formula cars and graduated at the end of the 2010. Over his years of involvement, the team progressed from a 64th overall place finish to 17th. In his final year with the team, he designed the University's first carbon fiber monocoque. Thomas has now moved on to work as an Aero Design Engineer in Switzerland for Formula 1 team; SauberF1. John joined the Formula SAE team in 2008, becoming the Electrical Section Head in 2009 until graduating in 2010, and participated in 3 years of designs and builds. His 2010 thesis project (coauthor Michael Jean) focused on the design and implementation of the electrical and controls systems for the car that year, and won the IEEE Ted Glass award. Since graduating the UofM in 2010, John has held positions at Iders Inc. in Manitoba, Honda Racing (HPD) in Los Angeles, Tesla Motors in the SF Bay Area, and in fall 2017 will be joining an autonomous driving group with Audi in Munich, Germany. “I can probably credit nearly my entire career path to what started in the SAE workshop in Engineering E3. I was initially a Cs-get-degrees type student, but found such direct application of the course material to what we were working on, and such inspiration in Formula that I completely turned around and started working towards As and learning as much as I could on my own about everything. Coupled with the enormous hands-on, multidisciplinary exposure, Formula SAE set me up for the future. Michael was an inaugural member of the Formula Hybrid team in 2008-09 where he designed the power delivery network and internal combustion engine controller. In 2009-10 he joined the Formula team and, together with John Hughes, designed the hardware and software for all aspects of the vehicle including driver controls, wireless telemetry, brake biasing and pneumatic transmission actuation. Together, they used their work as the basis for their capstone project and subsequently won the IEEE award for best undergraduate thesis at the University of Manitoba for 2010. Presently Mike works for the iPhone hardware team at Apple in Cupertino, CA in a dual capacity as both a hardware and software engineer. He has been a key contributor to several areas such as haptics, biometrics and wireless charging. "Without UMSAE, I don't believe any of the great career opportunities I've been afforded would have been possible. My thesis work (which was a direct derivative of my work on the team) was my key selling point to potential employers like Motorola and Apple. Involvement in SAE is highly respected by engineers whether they are past members or not; I believe this is because the challenges of SAE closely resemble the challenges we face in trying to ship new products to consumers.